They don’t seem to mind flying into fire and turning into a flying fireball of death for heroes. Skaerva’s face is funny sure, but look at Lorelei. Now thats the most amusing horror I’ve seen. Poor “Pamela”, this isn’t running as smoothly as she’d like. 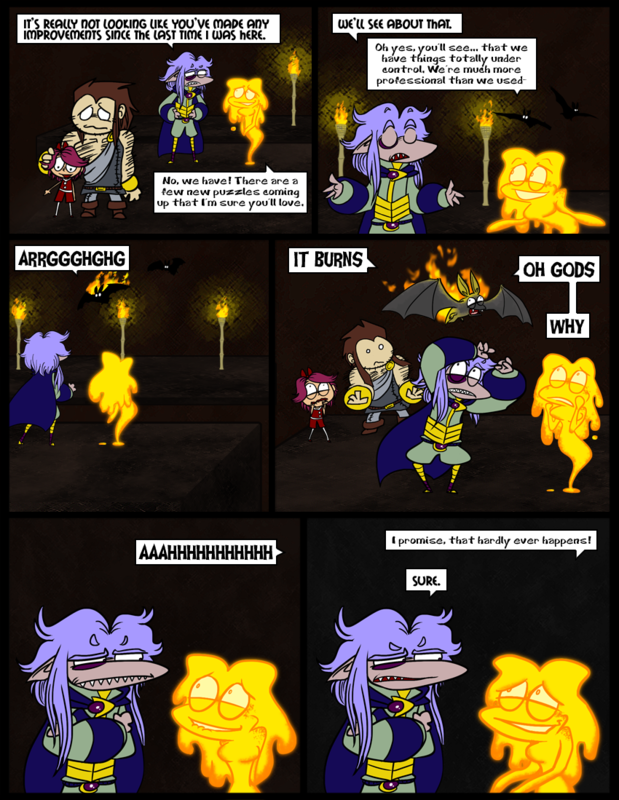 The funniest things in this comic are a poor little creature enveloped in flame and a young girl’s utter horror and dismay. What have I become…? Haha, I seriously had to keep myself from laughing at that bat! Why not laugh at it? My roommate was trying to sleep. Otherwise my raucous laughter would have resonated throughout the hall. Overall: a fantastic day. This was the icing on the cake for me today. Can't wait for the next one, I absolutely love this comic!!! Aww, and I love this comment. Things are looking up for me now that the play’s over, so once I get my life back in order in the next few days, comics should be on time all the time! Uh… most of the time. i think Skarva needs a hair cut. Yeah, his front-locks are really getting out of control. His hair has grown significantly in the last day (of comic-time), hasn’t it? Wow. For some reason, this comic in particular makes me realize how much better you’ve gotten at drawing these comics. heh…hehh. thats how it happened….